When you are considering getting your Wreck Diver Specialty Certification,you might be surprised to hear that Palau is one of the best places in the world to explore sunken shipwrecks. When you think of Palau, the image of our great reefs, our best in the world drift dives, cavern dives, huge schools of pelagic species, and some of the best biodiversity in the world comes to mind. Shh, lean a little closer to the screen. We have a secret to tell you. We let them think they are the wreck dive capital of the world so that divers from around the world dive the “Ghost Fleet of Truk Lagoon.” Palau is known as the best for so many things; we feel it is only fair and being a good neighbor not to take the title “Wreck Capital of the World” from them. 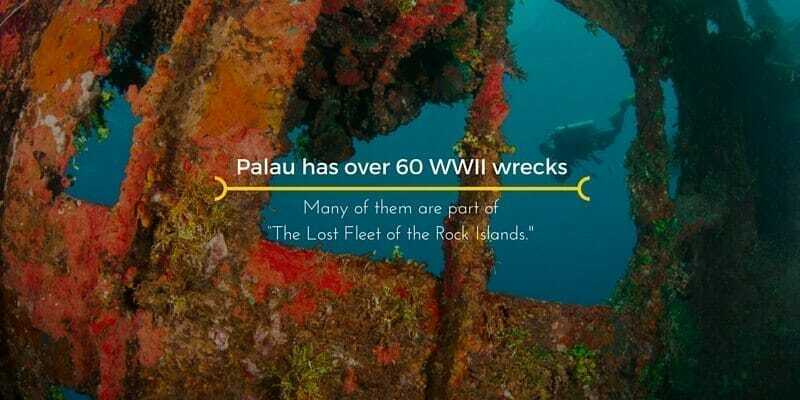 Palau also has over 60 WWII wrecks, many of them considered a part of “the Lost Fleet of the Rock Islands.” There is a good mix of wreck dive sites for both recreational divers and technical divers. While live munitions and deteriorated conditions make a penetration dive unsafe on many of the wrecks, some wrecks are available for penetration by trained divers. This PADI course is designed to give you a greater appreciation of wrecks and includes skills that can be used to evaluate a wreck from the outside and to train you for limited penetration. Penetration of wrecks by recreational divers certified as a wreck diver is limited to the edge of the light zone. This means while in a wreck, you can always see natural light. While night dives on a wreck are an amazing experience, penetration dives cannot be done at night as there is no natural light zone. While the skills needed for a wreck penetration is a part of the course, the penetration dive is optional. When you are not interested in wreck penetration, you will still find the course very informative and fun. The course has three presentations and four open water dives. As, we only have a small group of divers for an entire diving week, working in a specialty course such as this wreck dive specialty is easy for us to accomplish. What to expect when you start your wreck dive training in Palau? Presentation 1 and dive 1. The first presentation includes a review of why people enjoy diving wrecks. 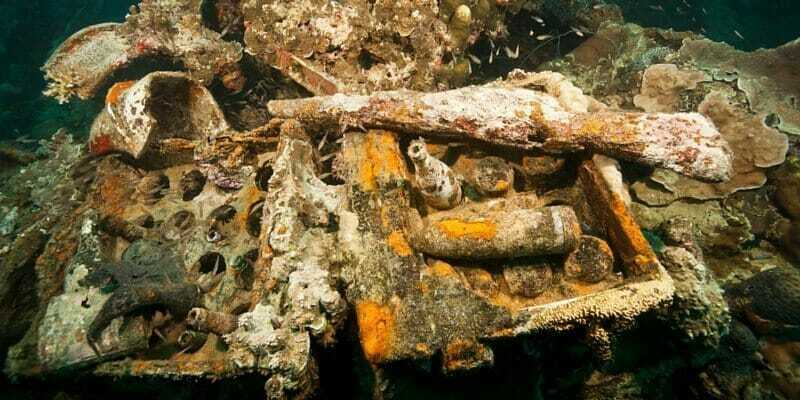 Curiosity is, of course, a big reason, but many wreck divers are drawn by the history. Underwater Photography on a wreck can give some very dramatic images, and wrecks are beacons for marine life to settle. Shipwreck laws are also reviewed as is the importance of preserving the wrecks for future generation divers. Wreck diving hazards and diving techniques make up the bulk of the first presentation. The first dive is mostly about navigation the outside of a wreck and identifying hazards. Presentation two covers the topics of researching wrecks and how to map a wreck dive site. On the second dive, you will explore the wreck and create a map of the wreck or a portion of it if it is large. You will also look for points that can be used to penetrate a wreck. Presentation three covers the procedures and skills necessary to penetrate a wreck within the light zone. The importance of buoyancy control is impressed as well as potential problems poor buoyancy can cause such as silt outs. A silt out can be a dangerous situation where a diver disturbs fine silt within a wreck that lowers visibility to zero. It can often take a long time to clear. The presentation covers ways to prevent silt outs but also how to react if one happens. Divers entering a wreck always should do so with a line and reel. The presentation will demonstrate, and you will practice using the reel on land. The third dive is a practice of the items covered in the presentation and is done outside of the wreck but stimulating a penetration dive. The fourth dive is the actual penetration dive. If you do not feel comfortable entering a wreck, you can perform the task outside the wreck like dive three. Why Choose Palau For your Wreck Dive Certification? Palau is for serious divers. This does not mean that it is only for highly experienced divers, it just means the divers that are coming here are coming for diving and experiencing what is the best diving in the world. Sure they will enjoy their off gas activities, and Palau does have many laid-back activities, but diving is king. The selection of wrecks is impressive. Our program of a dive week with only a small group of up to 10 divers is the perfect setting for training. Wreck diver certification requires four dives on wrecks of which one could be explored by penetration. This requirement can easily be incorporated into the weekly schedule. 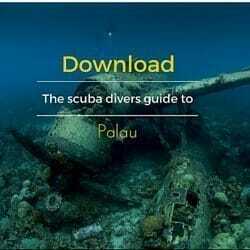 Learn wreck diving at the “real” wreck dive capital of the world, Palau. We just let people think Chuuk is, but once you dive our wrecks, you will know who the real one is.